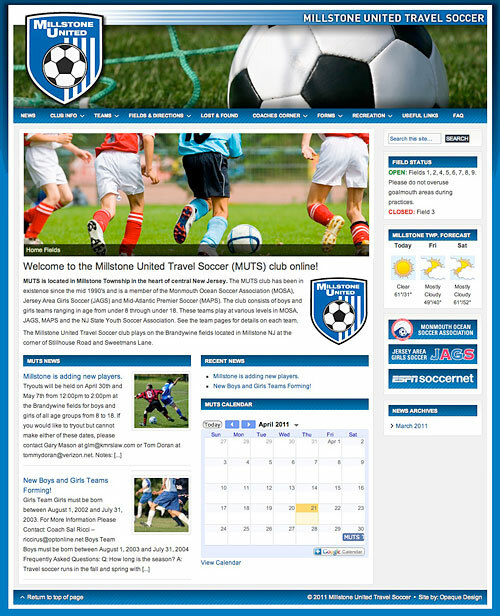 Site design for Millstone United Travel Soccer. This soccer club is based in central New Jersey and has boys and girls soccer teams in a variety of age ranges. Millstone United needed a site that organized a lot of club information in a concise format, and that they could add and update club news, minutes, and other information themselves. We designed the site to accomplish this by making news items prominent on the homepage, a featured pages image slider at the top, and putting the most referenced information like field status and weather in the sidebar. The overall design goal was to be modern, clean, and energetic. The site utilizes the WordPress platform for content management, which allows the site development costs to be kept manageable while allowing the client to easily make content changes.